On my last trip to Grand Canyon National Park, I visited Desert View in the eastern part of the park on the south rim. 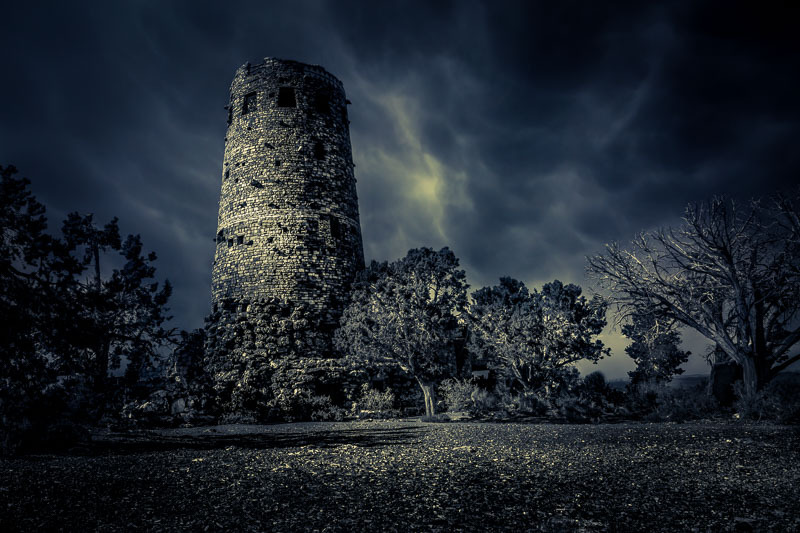 At Desert View you will find the Watchtower, which is a stone tower that appears to be much older than it is. It looks like it could be from Medieval times, or at least from a couple of centuries ago, but in reality it was built in 1932. I visited Desert View with the intention of shooting the sunset. Unfortunately, it was perfectly clear, so I wasn’t going to be able to make the kind of sunset photograph I like most. I tried to make the best of it, though. I made the image below that evening. Once I had this image, I did not wait for the sun to drop below the horizon. I was ready to move on. I turned my attention to the Watchtower. The tower is an interesting structure, and I think it offers many opportunities for photography. I am planning a sunset shot that includes both the canyon and the tower, but that will require a more dramatic sky. This night I had only clear skies, so I decided to do something a little different. I shot the tower with the idea that I might be able to give it a more dramatic look later on in my post-processing. I did a few things to this image to give it this look. First, I selected a picture of gray, stormy clouds from my catalog that I had taken in the past. I blended that image into the tower photo. I then removed almost all the color from the photograph. Next, I used a split toning technique, which involves adding a warm color like yellow or orange to the highlights (the brightest parts of the image), and a cool color like green, blue, or purple to the shadows (the darker parts of the image). That’s a common photographic technique that can create an interesting look in an image. Finally, I made some exposure and contrast adjustments to finish off the photograph. I like the result. It’s funny because this is not what it was like that night at all. To me this image is dark, gloomy, a little mysterious, and maybe even foreboding. In reality, it was a beautiful, warm, clear evening. My effort was an artistic endeavor in which I reshaped reality to conform to something I imagined, to create something completely different. It’s amazing what you can do with a little post-processing! In fact, I could have shot the canyon/tower image I mentioned above and then later substituted an appropriate sky from my catalog to create the final image I have in mind. I don’t like doing that, however. In landscape photography I almost never do it. It’s one of the challenges and rewards of landscape photography. You have to be patient, and sometimes it takes multiple trips to get the image you want, but the end result is worth it. I am not opposed to making dramatic changes to a photograph for artistic purposes, however, and that’s what I did here. It’s a lot of fun to do! 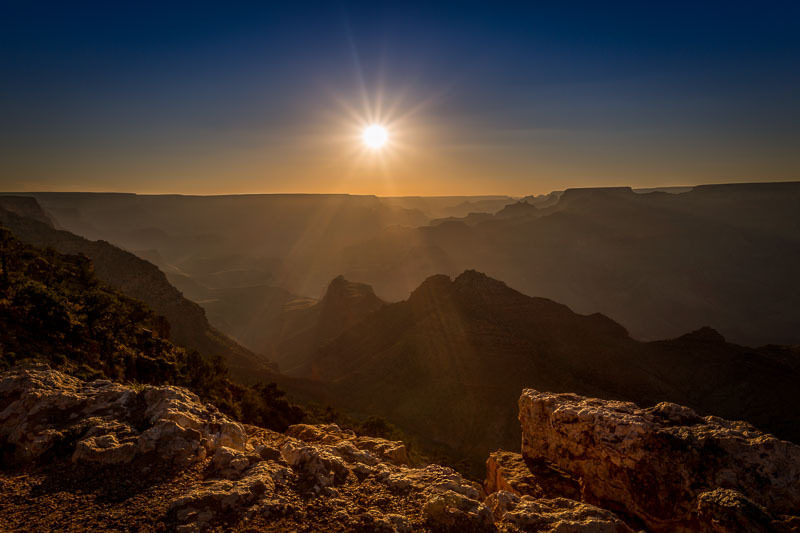 When I make the canyon/tower sunset image, though, it will be much closer to reality than this image is.